It is that time of the year again to have all your future education concerns and queries answered. What better way to gather all the information you need on this, housed under one roof at the BrightSparks Scholarships & Higher Education Fair 2018. The BrightSparks team has carefully selected and curated 12 seminars over the course of two days to help those looking to find out more about what options you can take in the next step of your education journey. Whether you are worried about moving abroad to further your studies, or selecting and committing to a local scholarship, the very people who have gone before you and experienced it all, are on hand to share what they have learned. They will also shed some light on how they managed to pull it off, and what you can do to prepare for this journey. 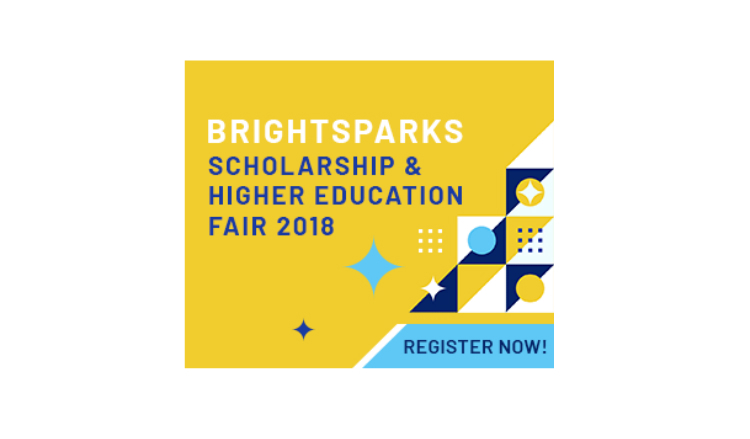 BrightSparks Scholarships & Higher Education Fair 2018 is in its fourth year. Each year, event patrons leave with a firmer grasp on what their future looks like, and the choices that they will make. Anyone journeying into this uncertainty will find great comfort in knowing that you do not have to go through the next phase of your life making blind decisions and uninformed choices. Grab ahold of any of the exhibitors, providers or speakers and they will be glad to share an insight or two on what is best for you. Furthermore, this fair will highlight some higher education course options from local and overseas universities that you may have overlooked, or did not know about. Opportunities for scholarship should not be taken lightly. Whether you are eligible for a scholarship, or working your way towards that goal, this fair will further motivate and guide you along the right path. Also at the fair, future employers (scholarship providers) are keeping a lookout for individuals who are ready to prove themselves and have a strong desire to contribute back to society and effect change in respective industries. Over the course of the two days, participants are given the freedom to roam the halls in search of finding out what options are available, listen to keynote speakers on what to expect or just mingle and network with potential future employers. Come expecting to learn, to discover but also, remember that this journey of yours should be fun and exciting. Don’t miss this valuable opportunity and register today! We will see you there!